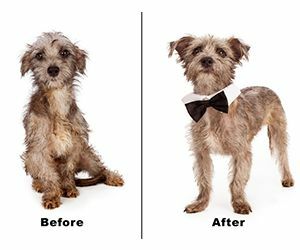 A makeover can make a life-changing difference - for dogs as well as people. Giving a shelter dog a bath and haircut can transform a mangy mutt into an adorable sweet-smelling pup that quickly finds an adoptive home. 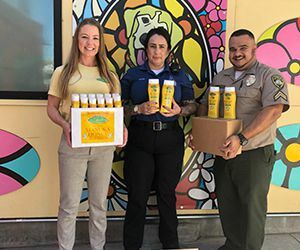 Recognizing this, Cardinal Pet Care has launched a program to donate shampoo and grooming products from its new EcoBath Manuka Honey line to rescues and animal shelters nationwide. The EcoBath Manuka Honey products are being transported to shelters - fittingly -- in HoneyMobiles. Attracting attention wherever they go, the vehicles' bright yellow signage displays the EcoBath Manuka Honey logo and clearly states they are "Animal Shelter" bound. Michelle Holbrook (Outreach Coordinator), Sara Muriello (Director of Outreach), Judith Gómez (Helping Paws Coordinator) with Tom Wien, Director of Marketing for Cardinal Pet Care. First HoneyMobile stop was the Pasadena Humane Society (PHS) in Cardinal Pet Care's own backyard. 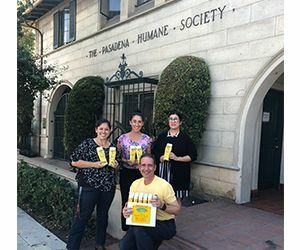 The PHS plans to use the donated EcoBath Manuka Honey products in its Helping Paws program, which helps pet parents who are experiencing financial hardship by offering free food and supplies. "Sometimes circumstances beyond our control make it difficult to keep our pets," explained Sara Muriello, Director of Outreach for the PHS. "Programs like Helping Paws make it possible to keep animals in homes and out of shelters." Next, the EcoBath HoneyMobile visited another California shelter, the Baldwin Park Animal Care Center, part of the Los Angeles County Animal Care & Control network, where Cardinal Pet Care's Marketing & Promotions Manager Kerissa Kelly-Slatten (left, above) presented the EcoBath Manuka Honey donation to Corporal Ricardo Ramos (right) and Animal Attendant Alma Aldana (center). Now it was time to roll out the HoneyMobiles nationally. 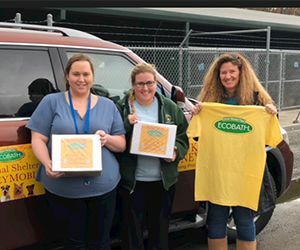 On the other side of the country, our sales rep Teri Worley (pictured below right) drove her HoneyMobile to the Walker County Animal Shelter in Chickamauga, GA. Pups there will benefit from the EcoBath Manuka Honey products by getting cleaned up, which will make them more attractive to adoptive parents, said the shelter's Chelsi Dill (left) and Cortney Andes (center). 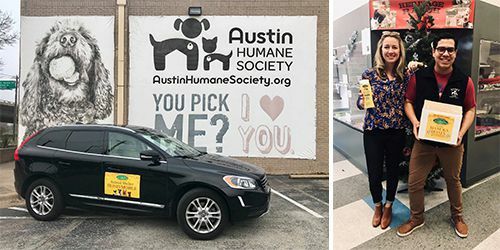 Then it was down to Texas, where a HoneyMobile driven by Cardinal rep Jessica Farrell (pictured above) brought holiday cheer to pets sheltered at the Austin Humane Society (AHS), like "Heidi," shown below with Ishmael Behrhorst, Development and Outreach Coordinator for AHS. Heidi and her friends at AHS are about to get sweeter than ever, because the EcoBath Manuka Honey products will be used in the shelter's Puppy and Dog Bathing Program. 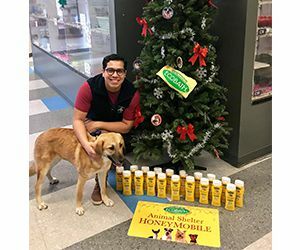 The HoneyMobile deliveries are just one part of Cardinal Pet Care's Sweet Dogs For A Sweet Cause charity campaign, which was launched to celebrate the arrival of the new EcoBath Manuka Honey grooming line. 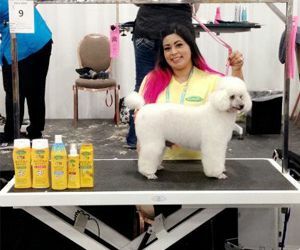 EcoBath is also sponsoring adoption events such as the WPA Rescue Rodeo Grooming Competition (read more), where professional groomer Jillian Ramirez (above) used EcoBath Manuka Honey products to spruce up rescue dog "Oliver." Additionally, EcoBath will be holding a social media photo contest to benefit rescue groups. Meanwhile, keep an eye out for the EcoBath HoneyMobile...coming soon to a shelter near you.